Last week, we noticed that God is using the trials we experience to make us more like Jesus. As painful and exhausting as they often are, they are needful in bringing God’s work to completion in us. God is good, even when life is hard. You are not yet what you will be one day. As we meditate on this for the next several weeks, I hope you will realize the Bible gives a realistic, yet hopeful, outlook on trials. God shows up in the midst of real needs to give real help. Would you like prayer? Let us know and our prayer team will pray for you. You are loved and you are not alone. It’s Easy to Spread Joy! A man went to observe a great sculpture artist as he created a horse statue from a large slab of marble. The artist studied the marble, tracing its veins and crevices. After he had become well acquainted with his material, the artist picked up his hammer and chisel. But before he could begin working, the observer stopped him. “How will you turn this slab of marble into the image of a horse? He asked. This is what God is up to in your life. 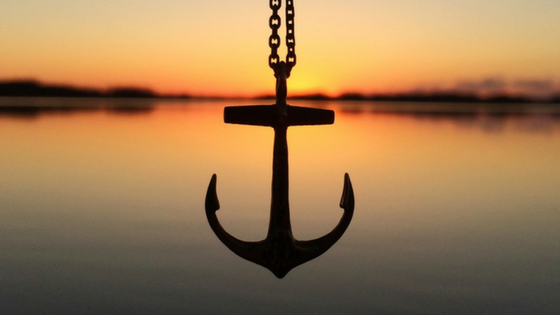 Trials are the hammer and chisel, and the image He is working toward is Jesus. His method of chipping away everything that doesn’t look like Jesus is often slow and painful, but it is necessary. In 1 Peter 1:6, Peter assures the suffering saints that, for a season, it is necessary for them to be grieved through various trials. Did you catch that? Peter says that pain and grief are needful for these men and women? “Needful according to who?” we might ask. The answer would be according to God. This may seem blasphemous, or even cruel, but when you consider it in light of God’s ultimate goal for your life, it is neither. God’s desires to make you like Jesus. You are being molded, transformed, and perfected in this life, and one of God’s primary tools will be trials. It is often the case that we realize what really matters in life through the pain and difficulties of intense trials. In this weaning process God opens our eyes and loosens our grasp on the temporal, superficial things of the world –those things we think we can’t live without. This is a painful process, but a necessary one, if the work of Christ in us is going to be brought to completion. Are you going through a trial? We would love to pray with you. Please share your confidential request with us. Did you know almost one out of four children in the United States have a chronic illness? One out of four!! 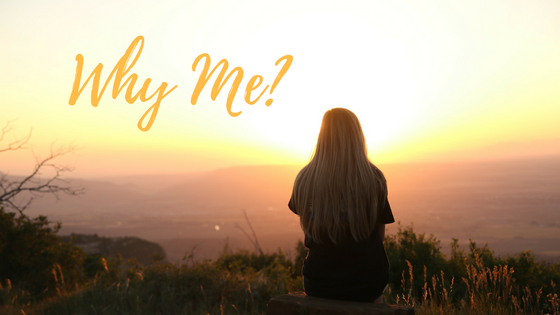 When a child faces medical challenges the whole family is impacted and some days can be difficult. At Spreading Sunshine we want families who face pediatric illness to know they are loved and not alone. 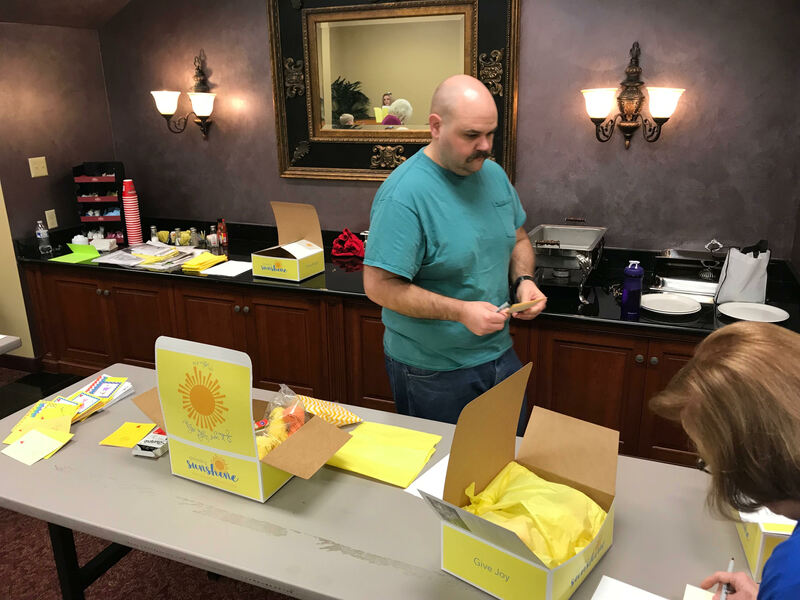 One of the practical ways we show love is to send a Sunshine Box, a care package designed to deliver smiles and joy to a child who has a chronic illness or special needs. This work is made possible because of the generosity of donors, volunteers and strategic partners. 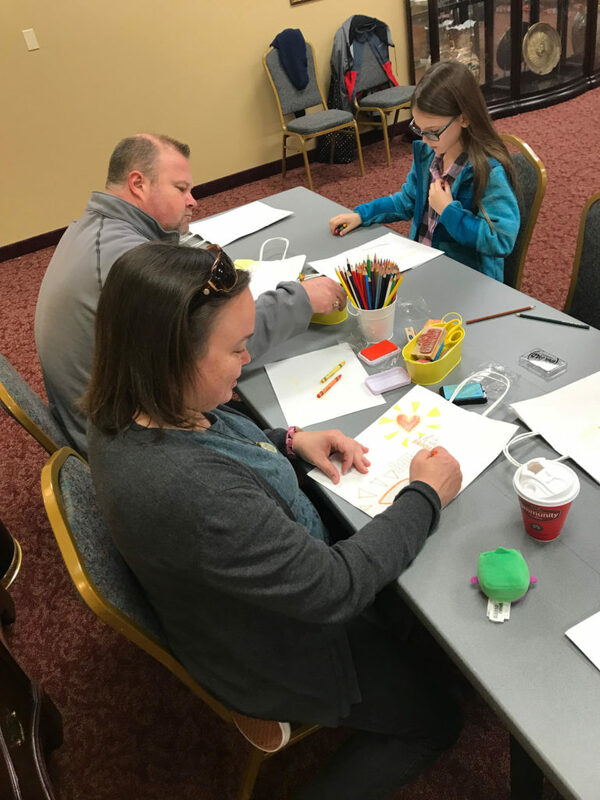 We are thankful to be working with Bellevue Baptist Church in Memphis, TN. 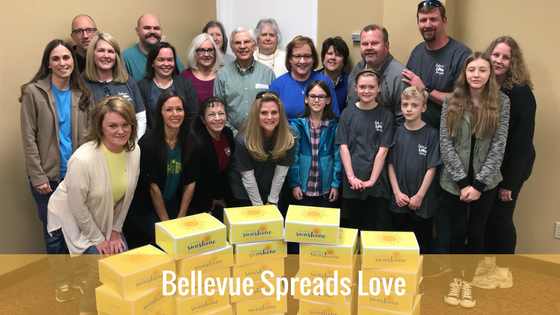 Earlier this month, a team of volunteers helped us spread love as a part of their Bellevue Loves Memphis work day. 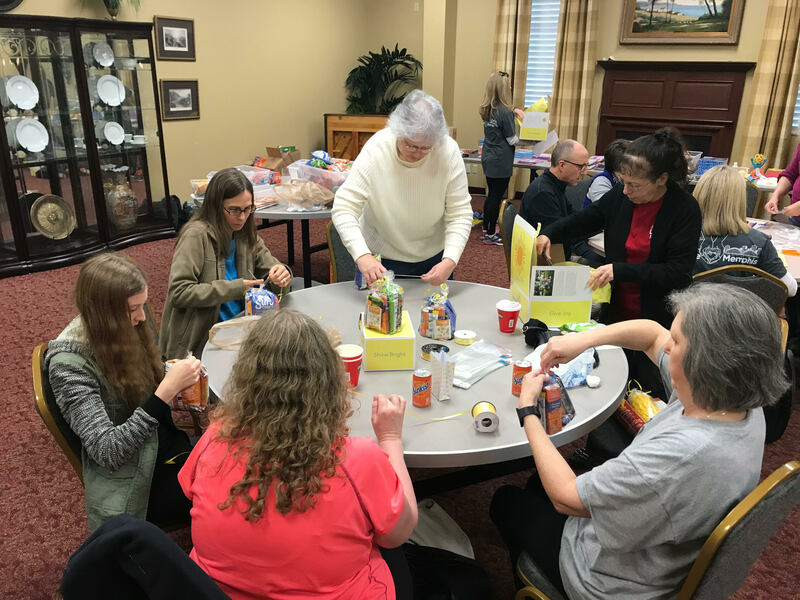 This sunshine crew filled 30 Sunshine Boxes, put together 100 Sunshine Treat bags, 50 mini-candy bags and decorated lots and lots of Sunshine bags. Sunshine Boxes and sunshine bags touch lives. 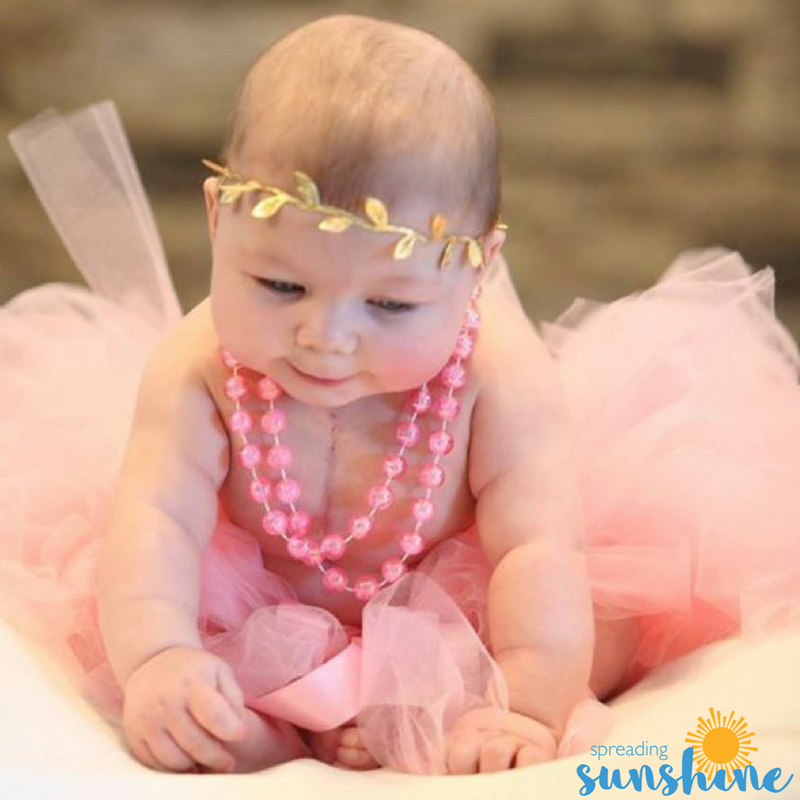 Meet Olivia, she will be receiving one of the Sunshine Boxes filled by our friends at Bellevue. Olivia has Hypoplastic Left Heart Syndrome. She also has right brain damage and under-developed white matter. We need your help!! Would you like to help us show love to families like Olivia’s? DONATE today or contact us to learn how you can get involved.